Bill Windsor at Missoula County Courthouse. Well, what can I say? I have said that a guilty verdict would be a better ending for the movie, but I didn’t want to be found guilty. I was, so the movie will end with what I hope will have audiences shaking their heads in disbelief. I had my appeal ready just in case, so I advised Judge James A. Haynes immediately that my appeal was being filed that second. So, good news first. I was sentenced to only the maximum amount allowed by law — one year in the Missoula County Detention Center. Missoula County Attorney Jennifer Clark asked the Court to allow my 134 days behind bars, and he (likely most reluctantly agreed). So, I won’t be gaining any more weight on the excellent food at the Missoula County Detention Center. I am as free as one can be in Lawless America. I am not going to jail. After 845 days of being under restrictions of a TEMPORARY Order of Protection, most of those restrictions have been removed. Jennifer Clark asked for a permanent order of protection for the UNIVERSITYOFMONTANAEMPLOYEE. I argued that there was never even a hearing to expose all the lies. Judge James A. Haynes said he believes the law allows him to order no contact with the UNIVERSITYOFMONTANAEMPLOYEE, his wife, and the University of Montana for a year. So, that’s good in that after a year, I can expose this guy again. I can’t publish this UNIVERSITYOFMONTANAEMPLOYEE’S name for a year. This means the movie cannot be released for a year unless I take the names out. It was Kangaroo Court at its finest. I was denied 99% of my evidence. I was denied 75% of my testimony. I was denied 50% of my Opening Statement. I was denied 90% of my proposed Jury Instructions. Judge James A. Haynes committed a host of wrongdoing before the jury. I was terribly disappointed with the verdict, but not terribly surprised. I hoped the jury was upset with Jennifer Clark for the constant interruptions of my testimony, but apparently they weren’t. Based upon the facts, they couldn’t have found me guilty. They must not have liked me or believed me. I am going to publish my full Opening, Testimony, and Closing on www.LawlessAmerica.com. At the conclusion of the trial, Judge James A. Haynes asked me to autograph his copy of my Wanted Poster. I smiled and did. I hope it long serves as a remembrance to him of just what a corrupt piece of sh*t he is. Before the trial resumed this morning, I moved to have a mistrial declared. I cited about 10 reasons. Ignored. On June 14, 2012, Bill embarked on a 241-day road trip to all 50 states, filming 750 victims of government and judicial corruption. There are over 1,000 videos on the Lawless America YouTube site which will be edited into a single movie or be used for a follow up TV show. In February 2013, Windsor led a group of a couple hundred people to Washington, D.C., where they gave their testimony to members of the press and the Congress. Leading up to and following DC, Windsor decided that he would run for office and start a new political party. Windsor’s plan for reforming the corruption in America includes a complete reworking of the U.S. Constitution to include abolishing the death penalty except for acts of treason, which he also redefined. 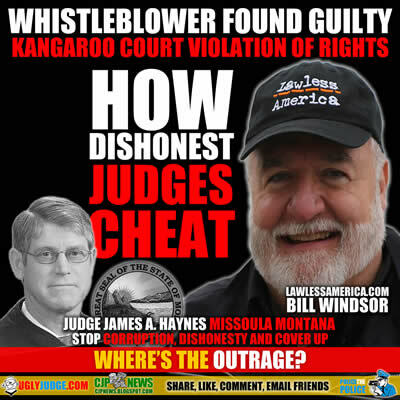 Windsor claims Lawless America is a member of the media with an online publication, an online radio show, and an online TV show and that he has the right to retain information about all members of the public with whom he has dealings. Will You Stand With Bill Windsor of Lawless America?